Do you own a portly pooch? Over 50% of pet dogs and cats seen in private veterinary practices are overweight or obese! In conjunction with Hill's Pet Slimmer programme, Orange Grove Vet now offers its own weight loss programme. Come into Orange Grove Vet or call to book a FREE weight and body condition assessment. Our knowledgeable staff will advise you on the correct diet for your cat or dog and if he or she needs to be on a weight loss programme. You will be required to bring your pet for regular weigh ins (free of charge). In no time you will notice a slimmer and happier pet! 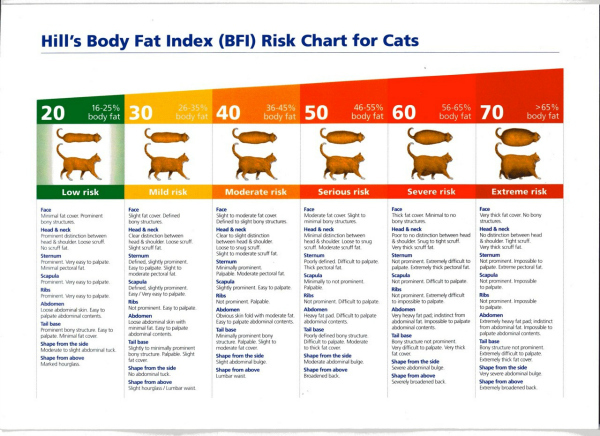 If you are concerned that your pet might be overweight, contact Nicola on how best to feed for the correct weight. Nicola will gladly assist you with all aspects of your pets' nutrition, exercise, treats, toys etc. To set up an appointment email nicolab@ogvh.co.za or call (011) 728 - 1371 and speak to Nicola. 1. Bone and joint stress. 2. Greater general anaesthetic risk. 10. Impaired ability to groom. 13. Delayed wound healing after sugery. 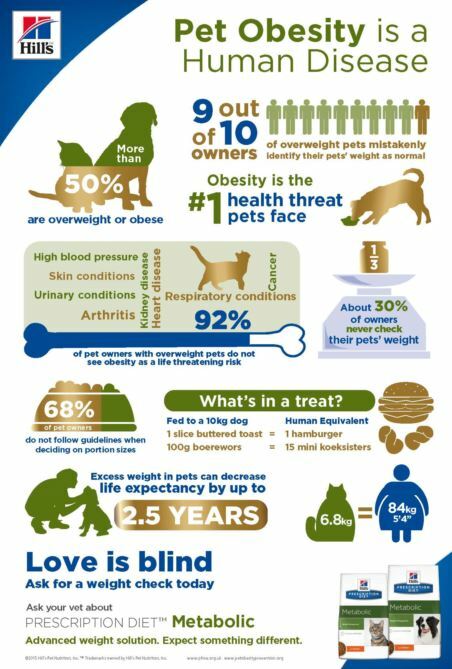 Understanding pet obesity and striving towards a healthy lifestyle for our pets. Dogs and cats don’t put on weight overnight. It is a process that takes weeks, months, even years. With that said pet weight loss is not a quick fix and takes dedication on the part of the owner to help their pet shed those extra pounds. Step One - Check if your pet is overweight. This can initially be done by the owner and then by a trained veterinary professional. A simple test to check is to look at your dog or cat from above – can you see an hour glass figure or tuck in the waist line just after the abdomen? If you can, great! If you can’t or are not sure then gently feel along your pet’s abdomen – can you feel the ribs? If you are having difficulty seeing a waistline or feeling the ribs, your pet is most likely overweight. 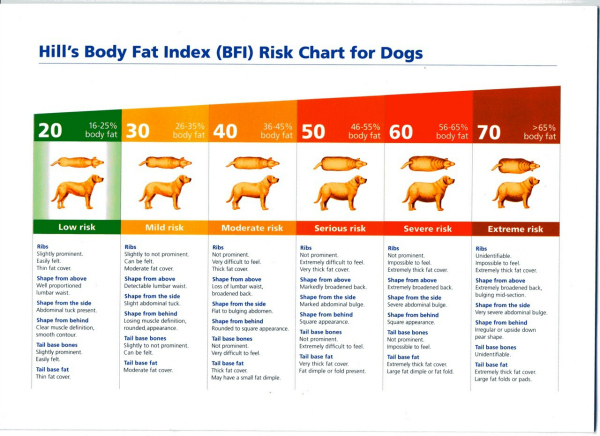 See below an example of a body condition score chart used to determine whether your pet is overweight or an ideal weight. Take your pet to your veterinarian and have him or her weighed and assessed. Your vet will be able to determine how overweight/obese your pet is and how much it needs to lose to reach its ideal body condition. At Orange Grove Vet, we understand that your pet's weight loss won't just happen overnight. Changing your pet's feeding habits and diet is a commitment by the whole family. 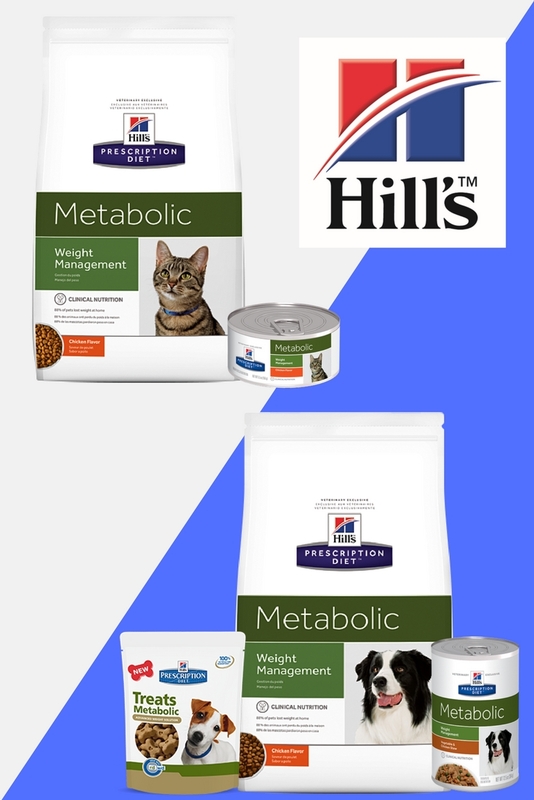 Orange Grove Vet is a certified Hill's Pet Slimmer Veterinary Practice and we have had great success with our patients usually Hill's Prescription Diets, specifically their Metabolic range. Click here to learn more about Hill's Metabolic dog & cat diet.